Child6-12 years old. Under 6 are free. 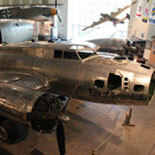 The National Museum of the Mighty Eighth Air Force preserves the stories of courage, character and patriotism displayed by the men and women of the Eighth Air Force from World War II to present. 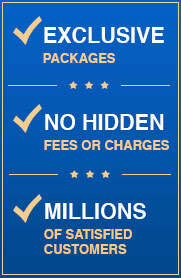 "One of the world's most powerful museum experiences". Experience World War II every step of the way, from the "Prelude to War" to the "Combat Gallery" to "The Lights Come on Again"
The Museum's 90,000 square foot facility encompasses exhibits displaying photographs, letters, diaries, journals and artifacts that together capture the essence of this significant time in our nation's history. 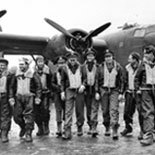 The 9,000+ books, original photographs and manuscripts, oral history interviews and personal accounts from World War II veterans are utilized by authors, historians and students completing in-depth research on Eighth Air Force history. The Museum's compelling and powerful exhibits begin with the Prelude to War exhibit, describing the global conflict prior to the United States entering World War II. Visitors are then engaged in exhibits depicting the United States' role, particularly the Eighth Air Force's role during World War II. 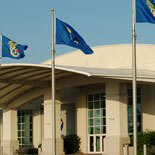 The Museum consistently updates and creates new exhibits to enhance the visitor's experience. They recently updated the Mission Experience and completed a renovation of the Cambridge American Cemetery and Memorial exhibit. 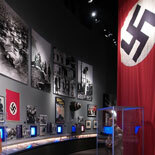 They have begun a significant upgrade to the POW exhibit. New exhibits are in the planning stage, including a ground crew exhibit to coincide with the completion of the B-17 restoration, and a post-World War II exhibit depicting the Eighth Air Force's role in Korea, Vietnam, and today. 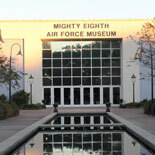 Get your eTickets now for the National Museum of the Mighty Eighth Air Force and pay your personal tribute. Parking is available outside of the Museum for all guests. Child Ticket: children ages 6-12. 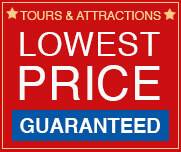 Children under 6 visit for free. Special rates are offered for Seniors, AARP, AAA, active and retired military, and World War II veterans are given complimentary admission.